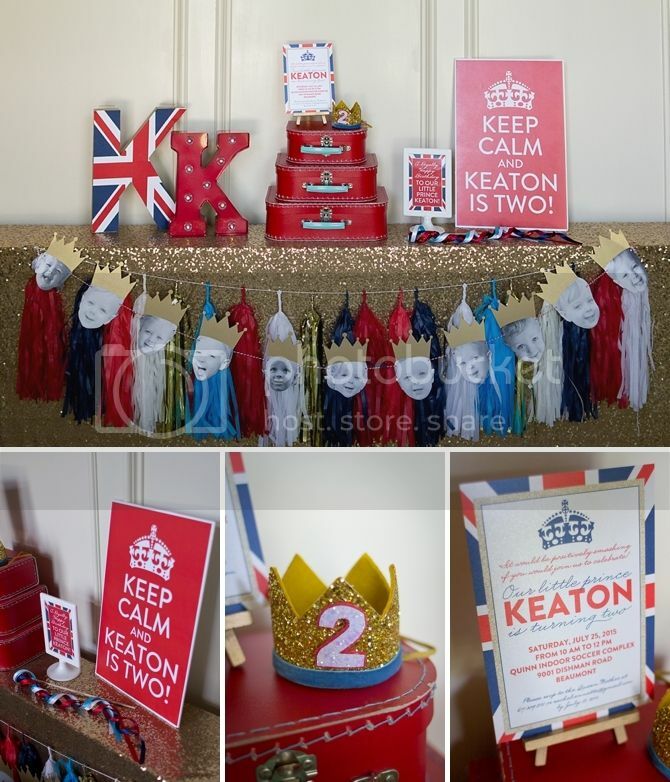 When you think of two year old birthday parties... the first thing that comes to mind is a Royal British party, right? No? Well--it worked perfectly for our little prince, who was born the same day two years ago as that other prince across the Atlantic. 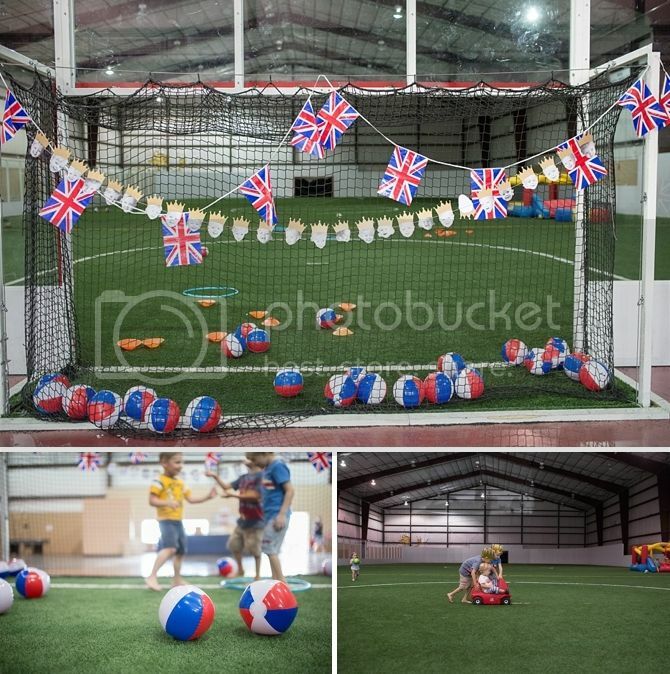 I rented the local indoor soccer field for the party, which was absolutely perfect. You can't let kids run wild outside in July in Texas--but they still want to! 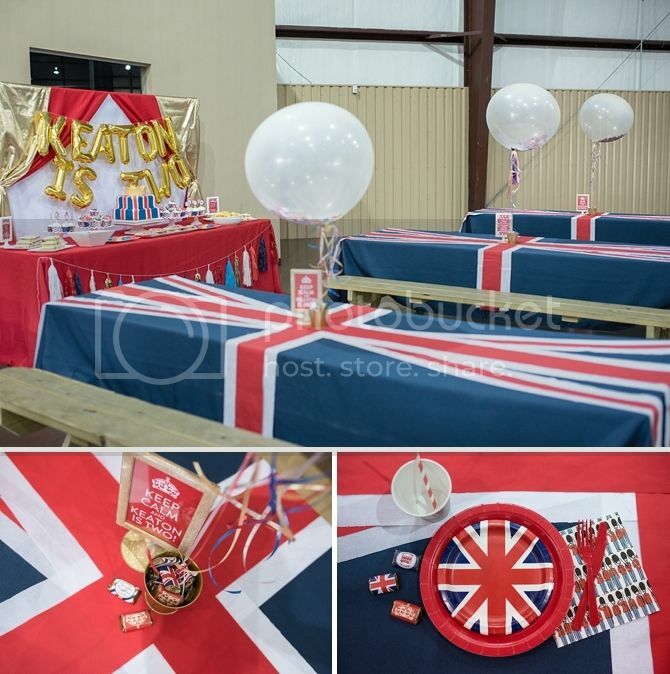 The venue came with four long picnic tables that were just asking to be draped in fabric to look like a Union Jack flag. Right? My fancy balloons backfired a bit--they were underinflated which means they weren't clear enough to really see the confetti or strong enough to support the weight of the fancy tassels I made for them. But they looked semi cute on some little gold buckets of chocolates. We had lots of sweet treats for the party. An AMAZING cake that was way past my expectations and adorable cupcake toppers that went right along with the theme. 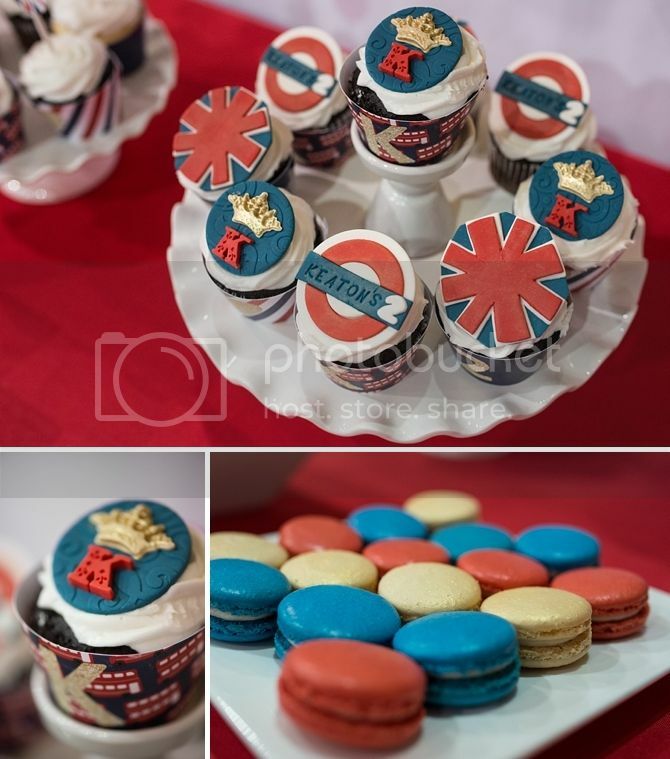 And I have a really hard time hosting a party without sugar cookies or macarons! 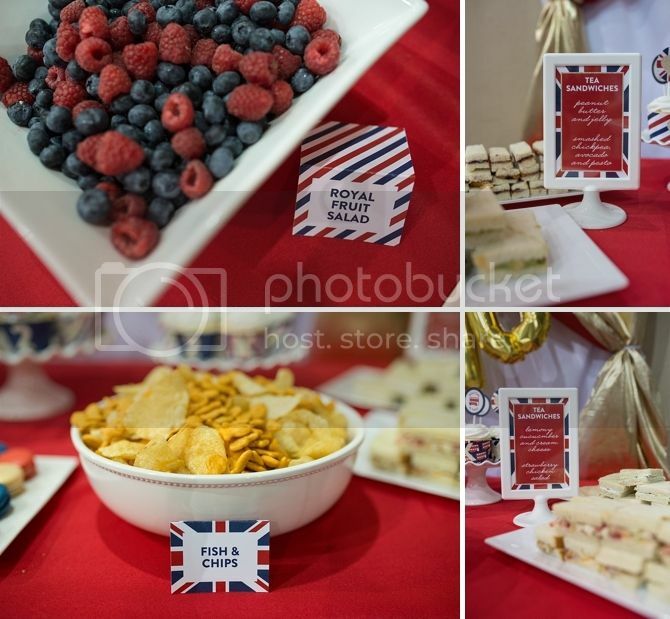 All the treats were delicious and complemented the theme perfectly. The party was from 10 to 12, so we served some tea sandwiches that were a huge hit (probably because I made them all on delicious white bread...) We had PBJ for the kids, smashed chickpea with avocado and pesto, lemony cucumber and cream cheese, and strawberry chicken salad sandwiches. The strawberry chicken salad was amazing and the recipe was highly requested. I thought my spin on "fish and chips" was clever... and it certainly was delicious. I had made really cute little signs for the drinks that somehow didn't make it to the party--so we had to improvise with BOOZE scribbled in crayon on an extra little sign. 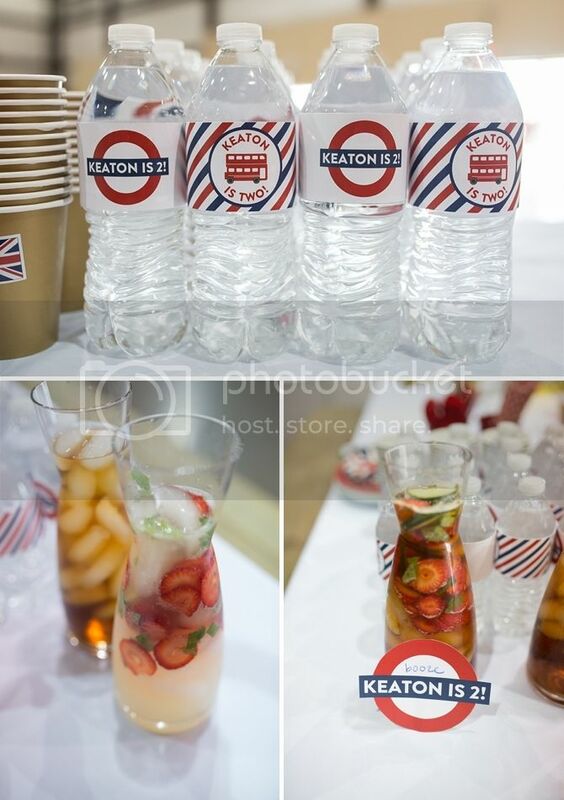 We didn't want the kid's version of the Pimm's Cup to get mixed up with the real thing! Keaton really really liked everyone singing to him--so much that he didn't realize we had snuck a cute crown on him. As soon as he realized the crown was on--he was mad. I'm pretty sure Braden was the one who actually blew the candles out, but Keaton didn't seem to mind. Also, I'm totally in love with their little Mini-Boden shirts. I ordered them a few weeks before we settled on a theme and want them to wear them every day. For the kids who needed a break from running around on the field--we had some coloring pages and crowns to bedazzle! 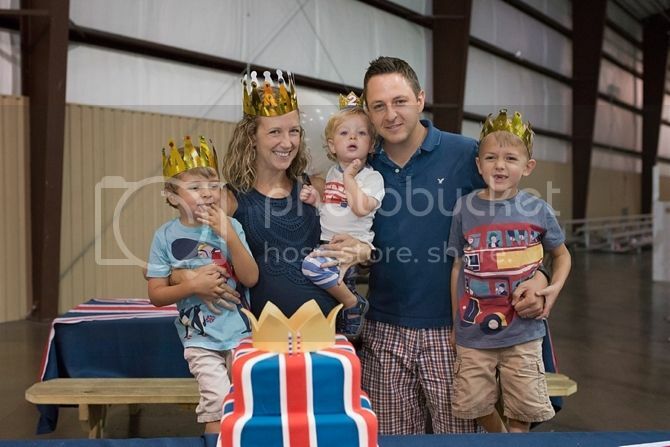 The crowns were so fun to make and wear! 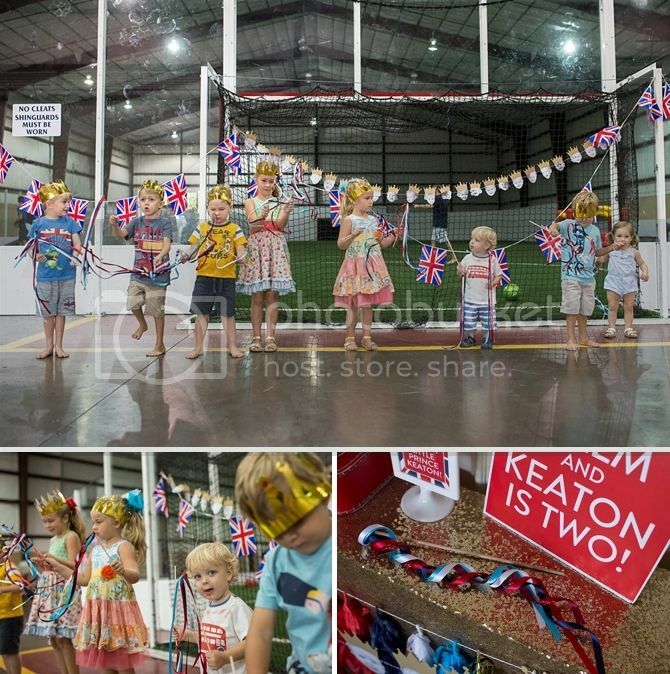 The kids all had a blast running around and waving the ribbon wands--they were so cute and fun! We had a bounce house, little car roller coaster thing, tons of beach balls and hula hoops for the kids to play with on the field. They ran around and had a blast--which meant the parents had time to chat! Using the London Underground symbol to welcome guests on the doors seemed so fitting! It also adorned the sugar cookies and several different printables. I ordered way too much Union Jack bunting on Amazon--but sometimes more is more. 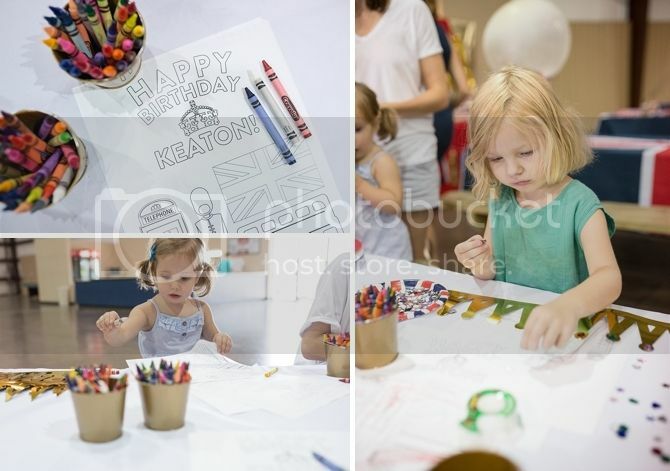 Probably my favorite part of the whole party was the awesome Prince Keaton banner. 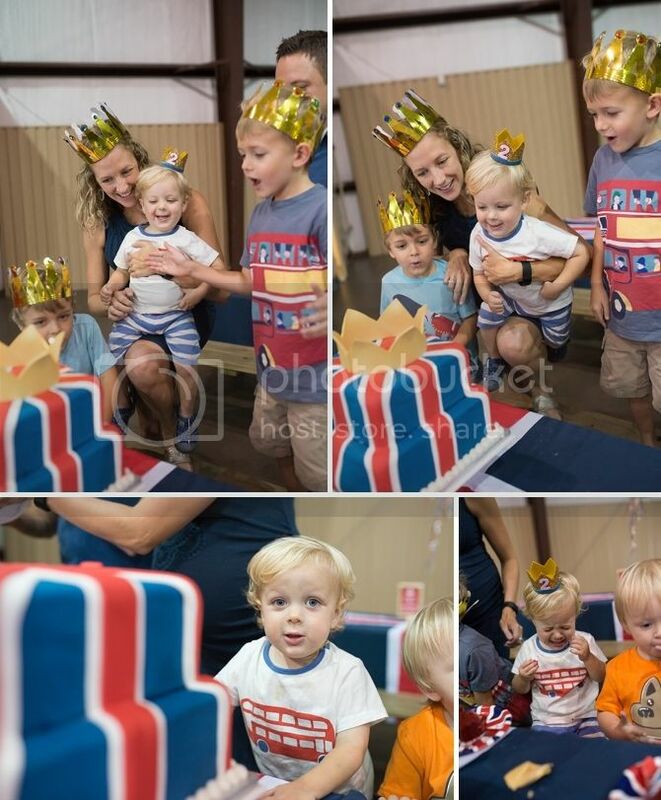 The gold crowns and pictures of his sweet little face make me infinitely happy. I cut the banner up and have it hung in various places around the house now. I needed somewhere to use my gold tablecloth (obviously) so I set up a little table at the entrance with more Keaton heads (also obviously) and an assortment of other things that matched the theme. Red suitcases (previously seen at Braden's second party), a little marquee K, the slightly overused "Keep Calm" sign... and other favorites from the party. 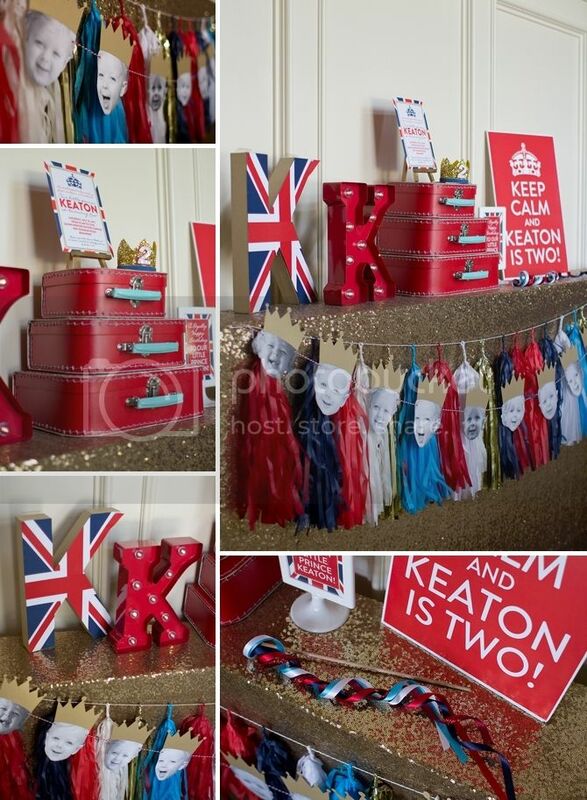 The sweet crown and ribbon wand obviously needed a place of honor! It was so fun. The birthday boy thoroughly wore himself out and ate a lot of sugar! As always, many many thanks to Jenn for helping photograph! I'm always so grateful to have pretty shots of all my hard work--and occasionally shots with me in them! You know you only call it the union jack when it is flying over a ship, otherwise it is just the union flag. Rose Tyler taught me that.